The full group of travelers who joined Ed Lewis and Randy Smith in Israel. Ed Lewis, executive director of CE National, recently returned from a trip to Israel with Randy Smith, pastor of the Grace Brethren Church in Sebring, Fla. Here is a report of the experience, which was sponsored by CE National. To read the complete story and see photos, click here. They hiked up and down Masada, slept in tents in the desert, rode camels, experienced the communal living of a Kabutz, stayed in youth hostels, took a boat ride on the Sea of Galilee, ate authentic Israeli food, floated in the Dead Sea, visited the sites where Jesus was born, walked, was crucified, and rose from the dead, saw peaceful demonstrations in Jerusalem, viewed Syria and Lebanon from the Golan Heights, and more. 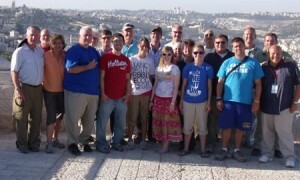 The group also did ministry in the northern part of Israel, helping a family who had recently lost their son in the war. Randy Smith provided excellent Bible teaching, bringing to life the stories from the Bible.